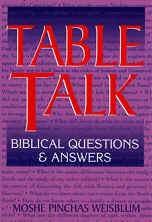 The Parsha of the Week Web page is a chapter age is a chapter from Rabbi Weisblum's book "Table Talk", which can be purchased at this site. You can also view informative and insightful discussions on each Torah parsha online at Torah Talk on You Tube. Q: In the parsha the first word is "And". What did the sages teach from this? A: The sages teach that along with the Ten Commandments received by Moses at Sinai, he received the civil law (M'chilta 21:1). Q: What is the purpose of Parshat Mishpatim in the Torah? A: In the western world, there is a distinction between church and state. The Torah teaches that all areas of life are intertwined. There is no separation of laws. The laws in this portion deal with all aspects of daily life. Q: Part of the civil law is penalty for inflicting bodily injury. Exodus 21:22-28 says, "Eye for and eye, tooth for a tooth..." What does this mean? A: This issue deals with a basic tenet of Judaism. According to the sages (Babylonian Talmud, Bava Kama 83b, 84a), the concept "eye for an eye" is interpreted as financial restitution. One must be careful in viewing laws such as these, and look to the Oral Torah for their correct interpretation. There is a law in the Torah (Deuteronomy 25:11,12) that states that if two men are fighting and the wife of one comes in the middle of them and punches him publicly in an embarrassing place, the Torah's rule is "You cut her hand, do not have any compassion." The sages explain that the concept of measure for measure is to be fulfilled through monetary payment. Since she embarrassed with her hand, she should pay money back "with her hand". The Rambam says that although the perpetrator deserves physical punishment, the Jewish court does not have the authority to do more than estimate the damage of her actions and convert it to a monetary amount. The statement of an "eye for an eye... tooth for a tooth...etc" is a statement that needs explanation, as it is not to be taken literally. If a man takes another man's eye, what good does it do for the man who lost an eye to take out the eye of the one who hurt him? After taking the eye, he would be no better off. Obviously, this is not the intention of the Torah; it is written this way to emphasize that in rectifying the damage, there must be total equality. To do justice in a case like this, one considers whether the injury was accidental or deliberate, whether the injured party contributed to the cause of the injury, and many other factors. At first glance, much of the meaning of Torah is not black and white. There is need for explanation and amplification. Both written and oral components are needed. Q: What is the biblical law regarding the punishment for the owner of an animal that causes injury or death to a person? A: There are two categories of animal damage: intentional damage and damage caused during the animal's normal routine. A domestic animal going wild is an unexpected and unusual occurrence and therefore the owner's vigilance in this matter is not to be expected. However, if the reputation of an animal becomes known as dangerous, the owner's responsibility increases. A man killing-animal is always put to death, but the treatment of the owner is another matter entirely, and will depend on whether the owner has been warned about the animal's behavior. The Rambam says the issue really revolves around the owner and his degree of carelessness in guarding the potentially dangerous animals. The question of payment also is an issue in this matter and again involves the owner's sense of responsibility in guarding his animals. Restitution for damaged property depends once again upon the vigilance of the animal's owner. He may be fined half the value of the damage done for the animal's first three offenses, and full damage once the animal has gained a reputation as reckless. This is a topic that requires extensive study. The Talmud devotes a great deal of time to various aspects of this body of law. Q: Where do we learn the importance of clearly teaching civil law to people? A: G-d said to Moses: "You must take the civil law and deliver it to the people in the clearest way possible" (Babylonian Talmud, Eruvin 54b). The sages give an allegory: "the same way that you prepare your table for guests, is the same way you must deliver the civil law." Q: "If you buy a Hebrew servant..." (Exodus 21:2). What is the Torah referencing? A: The Torah is referencing about a specific circumstance. If a Hebrew steals and cannot pay the fine that the religious court demands he repay his victim, then he is sentenced to serve the victim until the debt is paid. Q: The Talmud proclaims, "Whoever buys a Hebrew servant, buys himself a master." What does this mean? A: According to the religious/civil law (Exodus 21:3), the buyer of the Hebrew servant is obligated to give the servant's wife and children full nourishment and full responsibility for his physical and/or mental problems. The master is also obligated by law to make sure that the servant gets all the luxuries that he himself gets. The Talmud says if your servant does not have a pillow like yours then you must give it to the servant. Q: "And then the servant shall serve his master forever" (Exodus 21:6). How long is "forever"? A: Forever means until the jubilee (a maximum of fifty years) (Babylonian Talmud, Kiddushin 16a). Q: According to biblical law, in what manner can a male of female servant become free? A: A Hebrew servant is released after six years of service. This applies to both male and female servants. At the onset of the Jubilee Year (50th), all servants are freed regardless of time served. If a servant pays the balance of the debt, he is released. Q: According to the biblical law, what is the punishment for a person who curses his father or mother? A: The person who curses his father or mother is stoned to death (Leviticus 20:9). This is a deep topic that requires further study and insight for proper understanding. Q: What is the punishment for the person who hits his father or mother? A: The person how hits his/her parent with no intention of killing them but causes them to bleed deserves strangulation (Exodus 21:16-67; Babylonian Talmud, Sanhedrin 84b). A child is exempt from the death penalty if blood was not drawn or a black and blue mark was not left (Babylonian Talmud, Sanhedrin 84, Chulin 11). Again, this topic requires further study to gain the proper insight and understanding. Q: According to the biblical law, what is the punishment for a person who strikes another person, not his parents? A: The person who strikes another person must pay the victim five different payments: damage according to the court appraisal (the decrease in the monetary worth of the victime); payment for the victim's pain and suffering; medical expenses; lost time and wages' embarrassing payment. Q: According to the biblical law, how is the kidnapper punished? A: Two witnesses to the crime must pass a rigid investigation and identify the kidnapper in court. The, the kidnapper receives the punishment of strangulation (Exodus 21:16; Babylonian Talmud, Sanhedrin 85b). Q: In biblical law, what are the four different death penalties? A: The four types of death penalties are stoning, burning, by the sword, and strangulation. Q: The Torah states: "shall surely be put to death" (Exodus 21:16). What does this phrase mean? A: If the Torah does not specify the manner of execution, then death is by strangulation. The Talmud goes through much discussion concerning this issue. Q: "If there are two people fighting with the intent to kill each other and a pregnant woman passes by and is punched in the stomach accidentally and has a miscarriage because of this, the person responsible must pay the husband compensation for the loss of the fetus" (Exodus 21:22). What is the law if they kill the woman? A: This is a very controversial issue among the sages (Babylonian Talmud, Sanhedrin 79a). One side says the killer should receive the death penalty because the two men fighting had the intent to kill. The fact that the woman was killed instead of one of them is irrelevant. The issue remains the intent to kill. The other side says that the person responsible must pay to the woman's inheritor's the monetary value of what the woman was worth. Q: If a man digs a pit that is a danger to animals, but not deep enough to kill an animal if it fell in, and then another man cam and dug the pit deeper, so that it could kill an animal if it fell in, who is held responsible if an animal should fall in and die? A: The Talmud says that the second person, even if he dug only a tiny bit more, is responsible for the death of the animal (Babylonian Talmud, Bava Kama 51a). Q: What is the biblical decree if one steals livestock? A: Instead of paying the value of the stolen animal, the thief must pay five times the value of a stolen ox and four times the value of a sheep only if he subsequently slaughtered or sold the stolen animal. Again, this is an area that has engendered much discussion, that goes far beyond what is published here (Rashi's comments on Exodus 21:37; Babylonian Talmud Bava Kama 67b). Q: According to the Torah, what is the difference between and thief and a robber? A: Torah law differentiates between a thief and a robber. The thief is someone who steals without anyone seeing him. He sneaks and snatches covertly, afraid of being discovered. The robber is one who has no shame, no fear, who forces someone else to hand over his valuables publicly (Babylonian Talmud Bava Kama 79a).